The Brazilian polling institutes Datafolha and Ibope released tonight their latest opinion polls for the country’s presidential runoff election this Sunday, Oct. 28. 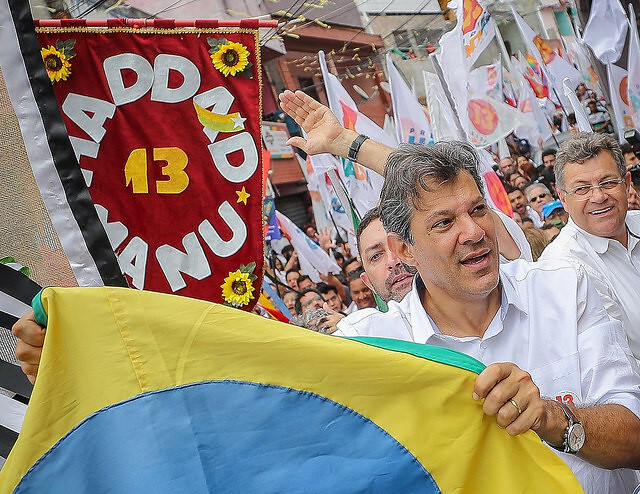 According to Datafolha, the far-right candidate Jair Bolsonaro is at 55 percent of voting intention, while the left-wing presidential hopeful Fernando Haddad is at 45 percent. The Ibope poll showed Bolsonaro at 54 percent and Haddad at 46 percent. In four days, the gap between the two candidates closed by 8 percentage points according to Ibope. The Datafolha survey showed the Workers’ Party candidate narrowed the retired army captain’s lead, from 18 to 10 percentage points in nine days.